Big win for the Vancouver MTB community! Hikers, trail runners and mountain bikers can get back onto the trails passing through Canada Mortgage and Housing Corporation (CMHC) land on Mount Seymour, about two weeks after 'no trespassing' signs suddenly popped up. One of the organizations that manages and maintains the trail network on Seymour, the North Shore Mountain Bike Association (NSMBA), met with CMHC on Thursday to discuss the trail closures and how the land would be managed in the future. 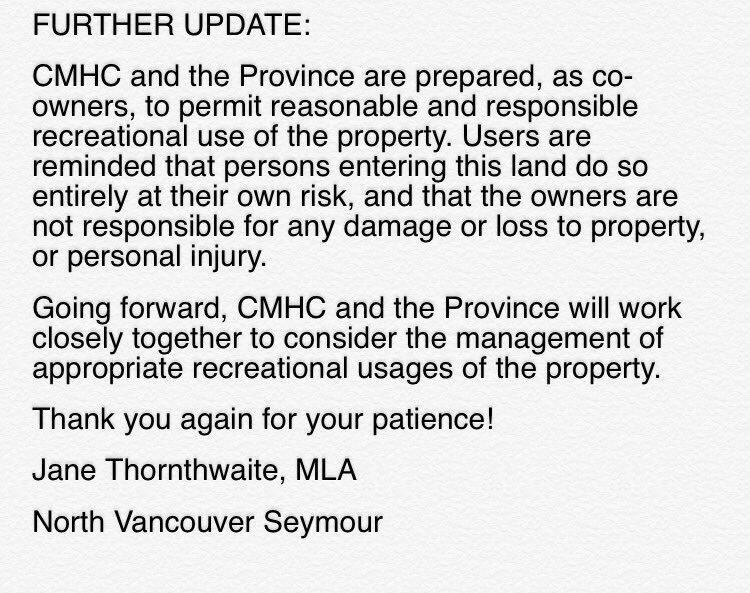 North Vancouver-Seymour MLA Jane Thornthwaite posted a note on social media announcing that CMHC and the province, which jointly own the 644-acre piece of land, were prepared to allow trail users back into the area. The note reminds trail users that people using the land, "do so entirely at their own risk, and that the owners are not responsible for any damage or loss to property, or personal injury."